Beautiful photo! This looks so good! The Mexican Stuffed Shells are big in my family so I'm going to have to try this. It looks delicious! 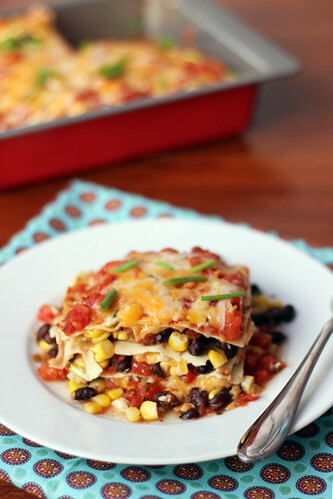 I loved this recipe and agree it's a fantastic meatless meal (one of my faves! )…you'd expect ground taco seasoned beef to be a part of it but its totally not missed. Great photo! I made this about a month ago when my dad came to visit, and we all loved it. I love your idea of using salsa for some of the tomatoes! Gorgeous photos of a delicious dish! 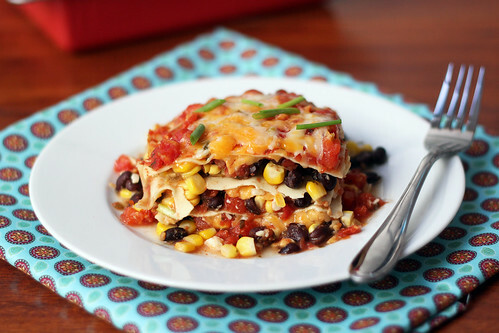 I have made this many time, using flout tortillas instead of lasagna- equally delicious. Serve with tortilla chips, salsa and sour cream. What a great idea. Can’t believe I haven’t thought of this. this is probably gonna sound dumb, but I’m new to freezing meals, so do I freeze it after its all cooked then I can re-heat later or do I freeze the pan before actually “baking for 45 min” ? Not dumb at all! I froze this before baking. So I assembled all the layers, covered it with plastic wrap, covered it with foil, and froze. When I was ready to use it I took the plastic wrap off and recovered with foil and baked. It will probably take closer to an hour if you bake from frozen. Hello there! Just wondering how I could make this into a 13×9 dish instead? Should I just add more of the mixture & noodles? Thanks! It looks so yummy! I think it would definitely work in a 9×13, but I think I would probably double the filling/noodles.